[SatNews] SES (NYSE Euronext Paris and Luxembourg Stock Exchange: SESG) has announced that in-flight communications services provider Gogo has started its first transatlantic connectivity service with SES satellite capacity. The launch of the in-flight service over the Atlantic marks an important milestone for the strategic partnership between Gogo and SES. The two companies signed satellite capacity and ground support agreements about a year ago, aimed at the continuous delivery of high-speed broadband internet connectivity services to passengers flying over the U.S., the Atlantic Ocean region and Europe. Gogo's Ku-band-delivered in-flight service relies on three SES spacecraft. The SES-1 satellite enables airline passengers flying over the U.S. to access Gogo's high-speed internet service, while the SES-6 satellite with its powerful mobility beams provides seamless coverage over the North Atlantic, and the SES-4 spacecraft serves Europe. All three spacecraft were instrumental in enabling transatlantic passengers to access Gogo's high-speed broadband for the first time. "Gogo has now entered the all-important international air travel market with SES by our side. Our first transatlantic flights represent the beginning of a new and exciting service for one of the most traveled airline routes in the world," said Gogo president and CEO Michael Small. "Beyond this historic milestone, we have secured capacity aboard a trio of well positioned and reliable SES satellites to deliver the level of coverage our airline partners must have to meet the growing demand among airline passengers for high-speed Internet access in the sky." 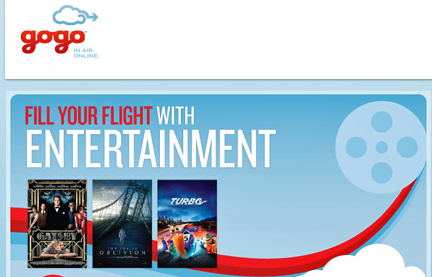 "Passengers aboard Gogo's inaugural transatlantic flights are mobility pioneers, proof positive that the sky is no longer the limit when it comes to high-speed broadband," said John Matlaga, Vice President, Sales North America Enterprise, SES. "Gogo has entered the international air travel market over the U.S., Atlantic and Europe with SES. We're honored to play such an important role in this advancement in global airline travel."